Arthritis, the commonly known joint disorder is caused due to multiple reasons; it basically leads to pain in the joints along with certain kind of disturbances and inflammation in the joints. Joint pains are frequently accompanied with arthritis which is of numerous kinds; the ranges can vary from wear and tear of cartilage to over reactive immune system which is rheumatoid arthritis leading to inflammation. Rheumatoid arthritis causes are unknown; a worldwide active research is going on in this case. The symptoms of arthritis come and go; they prevail till the disease is active and then they become inactive for a short period of time. The best way to overcome this disease and to restore movements is with Physiotherapy procedures, though there is a lot of confusion prevailing about arthritis, physical therapists are the best way to get hold on the pain. 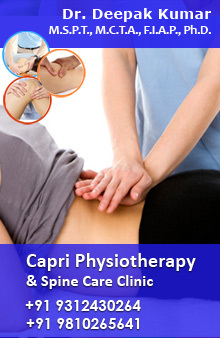 We, at Delhi physio carefully understand your pain and also take care that the techniques and activities implemented on you is under strict guidance. To eliminate the symptoms of aching joints, popping or clicking sensations, do not go for temporary and home derived treatments, all you need to do is to consult physical experts who will best work to determine the cause of the symptoms and will rehabilitate injuries by tackling them. Age, genetics, weight, previous injuries or infections are some of the factors that can make you the victim of arthritis. Some of our basic aims at Delhi physio are to make the people suffering from this disease independent by reducing their pain with the help of advanced machineries and equipments that will improve your physical movements. Our physical experts give vital advice and personally encourage the patients to exercise that leads to strengthening muscle power. Our services and treatments are offered in the most cost effective way, we believe that our dedication tied with your efforts can beat this disorder.